All the gates in the product range are fully welded, designed in accordance with the normal static load requirements and in accordance with DIN EN 12424 and 12444. 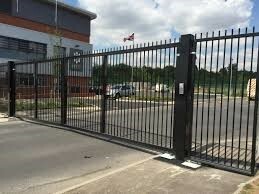 Ursa produce a wide range of security swing gates. Produced from fully welded mild steel, gates are available in either single or double leaf versions, and in any size up to 14m clear width and 3m in height. Our swing gates can be manufactured with a variety of infill options, from standard vertical bar, solid steel or timber, and decorative steel designs. We are able to design a gate to your exact requirements or match an existing fence or gate type. Choose between many finish colours to suit the your on site requirements. 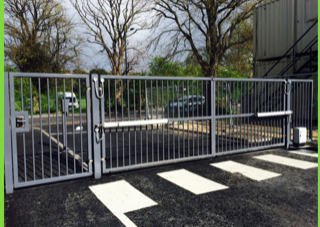 Manually operated gates are fitted with drop bolts and slip latch locking facilities as standard. Alternate locking systems may be specified, including fire escape or DDA compliant access systems. Automatic gates are fitted with either underground operators or our UR600 above ground operators depending on the size and specification of the gates. 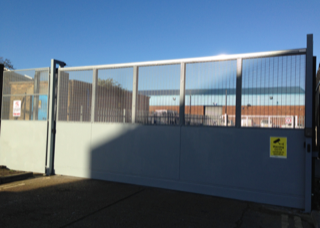 All our automatic gates are equipped with Category 3 safety edges and dual Photocells as standard to ensure compliance with all current safety legislation. For smaller, gates, hydraulic rams can also be fitted.